New studio update! My husband made me this awesome 4×8’x3′ tall workstation for the framing/supply room in my new studio. I am so thrilled with it. What a talented guy! 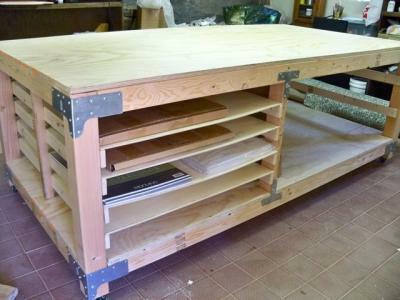 It has 36×48″ slide-out shelves for storage of large paper, matboard, and foamcore. The shelves slide out from either side, so paper can be loaded/unloaded either way, and smaller pads/sheets put in from both ends. On the other side is a large, open area for all those BIG things that I never have a spot for, such as larger panels, frames and frames and more frames, and assorted boxes of “stuff”. 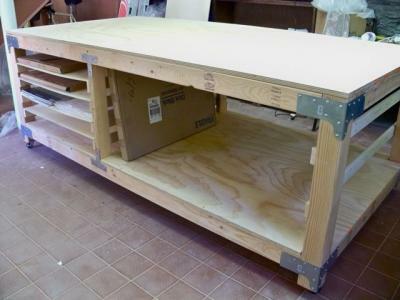 The table is massive, but he put it on casters so it’s a breeze to push it around the space as needed. It still needs a couple more coats of polyurethane, and I’ll be putting a sheet of homasote on the top to protect frames, cut glass, and protect materials. When priming panels and varnishing paintings, I’ll just throw a tarp over it and I’ll be ready to go with a super large work surface. $295.00 plus $10 shipping and insurance within the Continental United States. For local sales, shipping charge will be allocated to NYS Sales Tax. Please email me at JamieWG@aol.com for International purchases or with any questions. 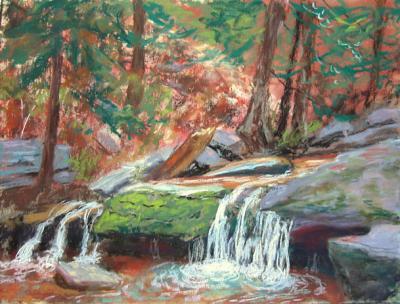 I was back up in Platte Clove today, painting the exquisite waterfalls in Devil’s Kitchen. We finally got a good, long rainfall a week or so ago, and all the waterfalls have been running strongly since then. I haven’t broken out the pastels for a really long time, and this was so much fun! Can’t wait to do more pastel work. The new studio is coming along. Expect a studio tour here on my website in the near future! 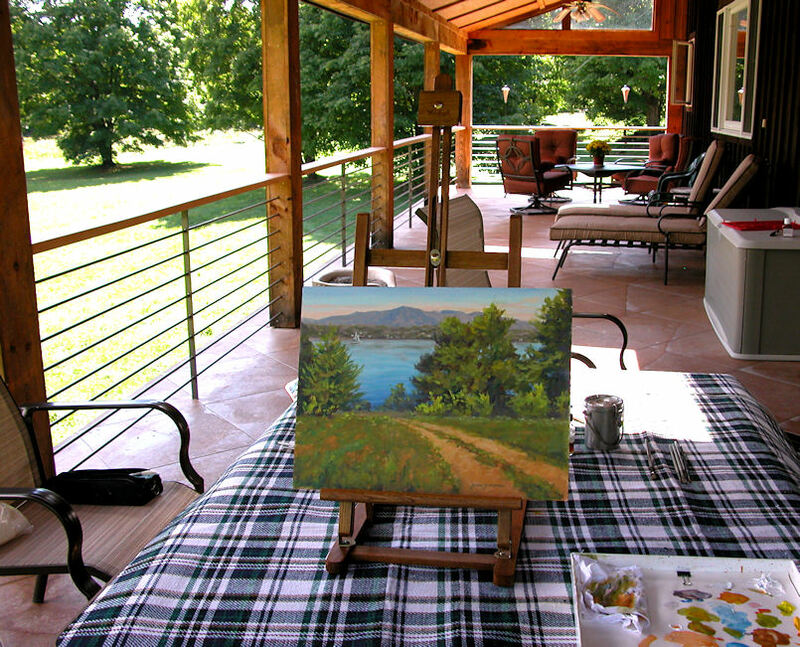 It was a gorgeous day today, and even though I was finishing up this painting from a photo instead of on location, at least I got to do it out on the patio and enjoy the gorgeous weather! This is a scene from Poet’s Walk in Rhinebeck, New York, along the Hudson River. It’s very close to where Chelsea Clinton got married recently. 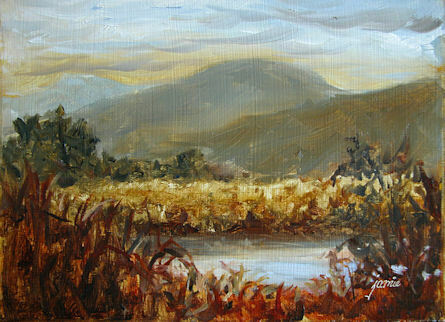 The mountains on the other side of the river are the Catskills. I enjoyed all the layers of color in this painting. 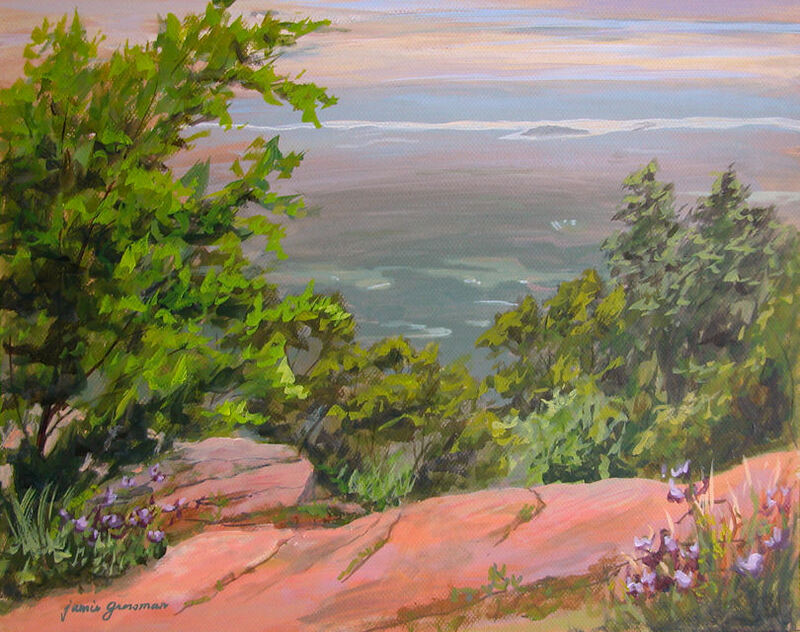 They add so much depth, and it’s always a great challenge to keep so much warm color and contrast in reserve for the foreground as I work from back to front and push the distances. My husband and I went on a picnic last week to Colgate Lake. We brought the dog along and had a wonderful day lazing by the lakeshore. I brought along my little 6×8″ Guerrilla pochade box and painted this while we chatted and he looked through a book of hikes in the area. 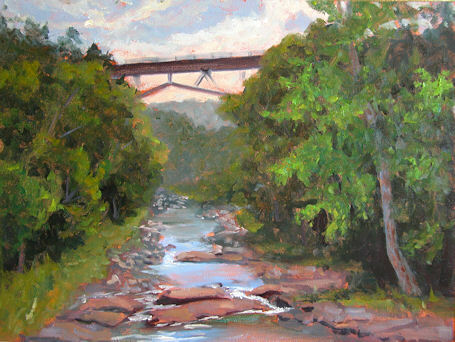 On the right of the painting is the bridge that crosses the outlet and the dam. Rondo was most interested in lunch! $695.00 plus $25 shipping and insurance within the Continental United States. For local sales, shipping charge will be allocated to NYS Sales Tax. Please email me at JamieWG@aol.com for International purchases or with any questions. 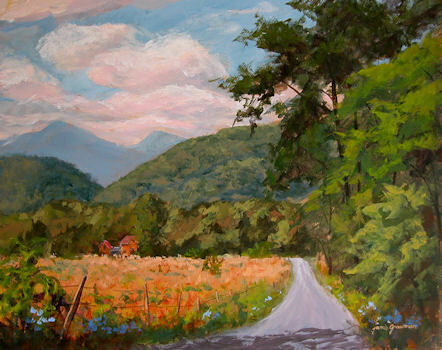 This painting features a view of the famous of Kaaterskill High Peak and Round Top mountains as seen from the Hudson Valley, where one enters Kaaterskill Clove. I did a small, 6×8″ version of this scene a few weeks ago and liked it so much that I returned to do a larger version. My husband and I went to North South Lake to catch the sunset. There were streaks of red and golden yellow, and the first star appeared in the western sky. I tried to catch what I could with my brushes while he busied himself with camera and tripod. The red in the painting is much, much softer than it appears in this photo, but I can’t seem to get the adjustments right to show it the way it is. I’ll just say that in this case, the image really does not do the painting justice! It looks a lot better in person, and is much more subtle. I drove up to Frederic Church’s Olana estate late one day last week. I love the way the late day sun lights up the front of the mansion. 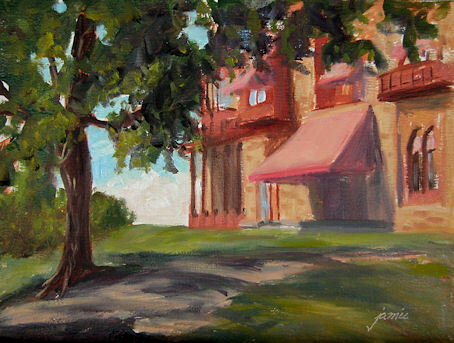 I found a comfortable spot to set up in the shade, with the path leading up the hill and one of the beautiful trees there breaking up the surface of the building and adding a nice foreground element. 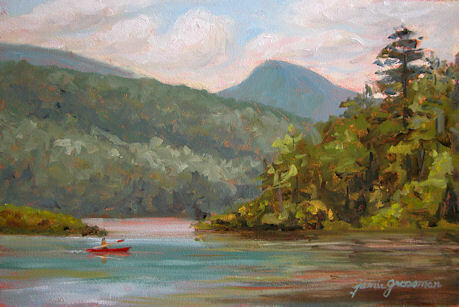 I was painting this beautifully serene scene at North South Lake in the Catskill Mountains, when a bright red kayak appeared as a perfect splash of complementary color! 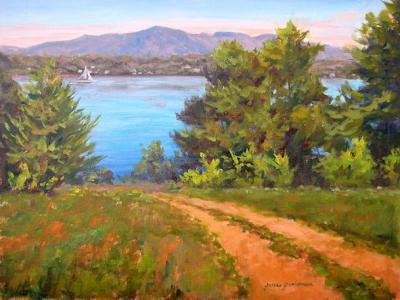 That’s Round Top mountain in the distance, painted from a different vantage point along the lake than my usual location. I found this new spot when my husband and I went for a hike around the perimeter of the lakes last week. Usually I paint near the tip of that peninsula on the right, but this new location enables me to add that point as a nice compositional element in the painting. I went back up to the Catskill Mountain House site, eager to do a larger painting overlooking the Hudson River Valley from up there. It was a fairly overcast morning, and looking out from the cliff’s edge, the most striking feature below me was the silver ribbon of the Hudson River off in the distance. 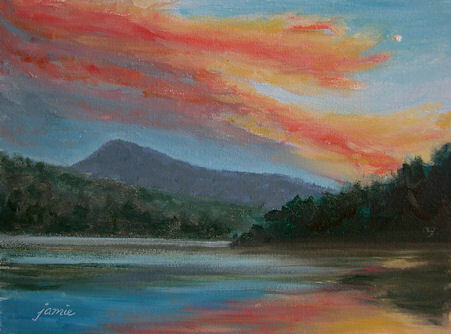 The Berkshire Mountains merged into the sky beyond the river. Bits of farms and buildings peeked up from below as the morning went on and the haze started to lift, so I put some of those in too as they came into view. This Canson MiTientes board has a fabulous surface texture, varnished to a beautiful sheen, and can be framed without glass like an oil painting. It’s my favorite surface for acrylics. Stay tuned for a special series on this surface sometime around November! My friend Karen and I like to drive around looking for locations to paint; then we pull off the road and set up when we find something that appeals to us both. We came upon this spot the other day that we’ve been admiring. The problem has been that there is no good, safe spot from which to paint this scene. We decided to throw caution to the wind and set up in the middle of the bridge. It’s around a hairpin turn, so we figured the traffic couldn’t move too fast there anyway, and the drivers would have plenty of time to see us. Fortunately for us, we didn’t encounter a situation where two vehicles had to be on the bridge at the same time! We made sure to only take up half the road; It’s a good thing that it’s the road less traveled! The bridge up in the distance is the New York State Thruway (I-87). 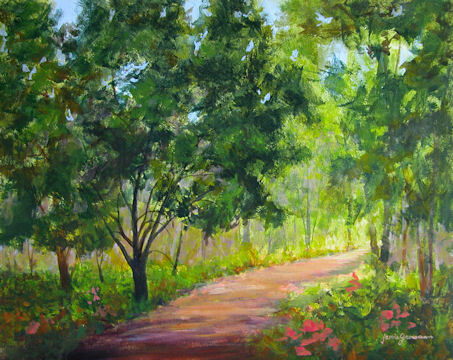 This was painted on location in my back yard. There’s a little path beyond the tree line that leads back to a beaver dam and pond — now almost dry due to the fact that we’ve had so little rain this year. This needs some studio work before I can call it finished. I’m going to put it aside for a week or so and then decide how much further I’m going to take it. 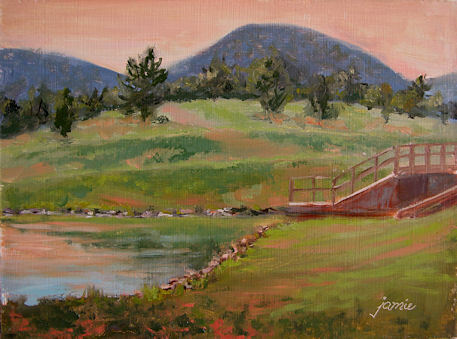 After painting the pond and mountains in monochrome, which you can see in yesterday’s post, I did painted it again using a limited palette of colors. This was done with just Transparent Yellow Oxide, Transparent Red Oxide, Ultramarine Blue, and Titanium White. Most of the lights were pulled out with a rag rather than painted in with white or a tint. Light colors portrayed this way have more luminescence. 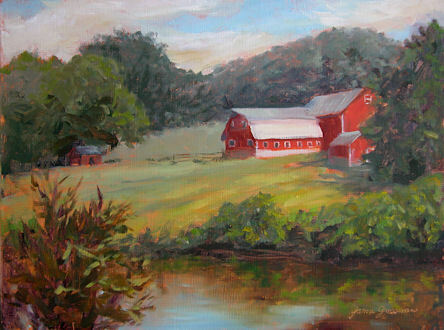 I’m looking forward to revisiting this scene for a full color version, especially in fall! 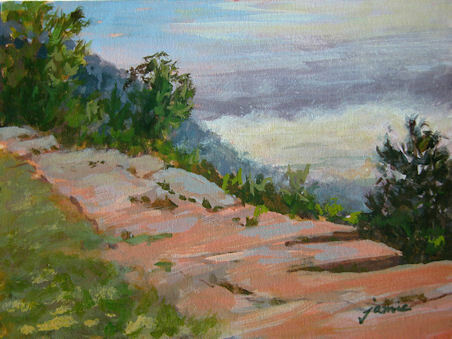 This painting was done on location on the cliff of the former site of the Catskill Mountain House on South Mountain. On a clear day, the view overlooks 60 miles of the Hudson River and a vista that extends all the way to Massachusetts. However, on this day, we were treated to a spectacular display of atmospheric clouds both below and above us, with occasional peeks through to farmland below and glimpses of the river. I love revisiting this location. It always has something special and new to offer. I guess that’s why Thomas Cole and Frederic Church kept coming back here too! Another thing that made this day so special was that I was accompanied by friends L. Diane Johnson from North Carolina, and Ruth Ann Sturgill from Ohio. It’s not often that I get to paint with friends from so far away! We spent a wonderful couple of days together, and I’ll be posting more about what we did and painted as I have a chance to finish up and photograph the paintings. I’ve been so busy painting up a storm out on location over the past couple of weeks that it’s been impossible for me to keep up with photographing work, blogging, and putting on finishing touches. Now things are settling down, and I’m hoping to get all these things up for you to see!